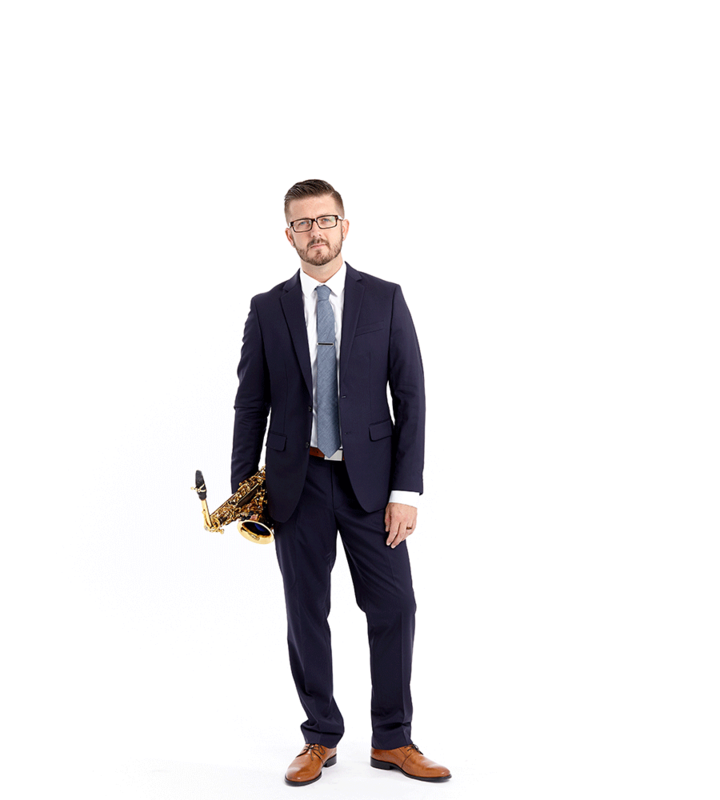 Dr. J. Michael Weiss-Holmes is a talented solo and chamber musician who “… is one of the rising young saxophone stars in the United States” (Saxophone Journal). He “ranks among the very finest of today’s young intellectually and musically gifted saxophonists” (Dr. Frederick Hemke). Professor Weiss-Holmes’ active playing career has seen him performing at some of the most prestigious venues in the United States, China, Australia, Taiwan, and Europe. Dr. Weiss-Holmes was recently part of a three-week European tour with the Chicago Symphony Orchestra under the direction of Maestro Riccardo Muti – sold out performances were held in the Philharmonie de Paris in Paris, France; the Elbphilharmonie in Hamburg, Germany; the Musik Haas in Aalborg, Denmark; the Teatro alla Scala in Milan, Italy; the Musikverein in Vienna, Austria; and finally the Festspeilhaus in Baden-Baden, Germany. Dr. Weiss-Holmes has received international acclaim as an orchestral saxophonist, and has performed as principal saxophonist with numerous orchestras including recent performances with the Chicago Symphony Orchestra, the Cleveland Orchestra, Lyric Opera of Chicago, the Hong Kong Philharmonic, the St. Louis Symphony Orchestra, the Peninsula Music Festival Orchestra, the Columbus Symphony Orchestra, the Fort Wayne Philharmonic, the Grant Park Orchestra, Sinfonia da Camera, the Toledo Repertoire Theatre, and the Champaign-Urbana Symphony. Weiss-Holmes has worked with such renown conductors as Riccardo Muti, Jaap van Zweden, Leonard Slatkin, David Robertson, Michael Tilson Thomas, Stéphane Denève, and Marin Alsop… just to name a few. He has also shared the stage with artists such as Ben Folds, Jane Lynch, The Temptations, Manhattan Transfer, and Idina Menzel. Dr. Weiss-Holmes is the Head of Woodwinds and Artist-Teacher of Saxophone at Roosevelt University Chicago College of Performing Arts, where he was also the Assistant Dean during the 2017-18 academic year. He was previously on faculty at the University of Illinois, the College of Wooster, and the University of Notre Dame. Dr. Weiss-Holmes is the Marketing Director for the North American Saxophone Alliance and served as Director of Marketing for Saxophones at Conn-Selmer, Inc. and as Artistic Advisor and Product Specialist with Vandoren. Professor Weiss-Holmes’ diverse background as a performer, educator and former member of the music industry have provided him with unique insight in preparing the next generation of music students for successful careers in their chosen field. As such, he has been invited to present clinics, masterclasses, and performances at some of the most prestigious saxophone programs both nationally and internationally. Weiss-Holmes is an active soloist of contemporary music and has commissioned and premiered numerous works for the saxophone. His performances have received great accolades and can be heard on the CSO Resound, Mark, NAXOS, Aucourant, SEAMUS and Klavier Record labels; including a recent recording of Percy Grainger’s Music for Saxophone which was released on the NAXOS Record label. Dr. Weiss-Holmes is the saxophonist on the Chicago Symphony Orchestra (CSO) Resound album’s release of a recording featuring the Chicago Symphony Orchestra and Music Director Riccardo Muti, playing an extended suite drawn from Sergei Prokofiev’s Romeo and Juliet ballet score. The Chicago Tribune describes this recording as “played here with a brilliance and panache that brought the dramatic narrative alive.” The disc can be ordered from iTunes here and from Amazon.com. Weiss-Holmes holds the Doctor of Musical Arts degree from the University of Illinois at Urbana-Champaign in Saxophone Performance, a Bachelors degree in Music Education from Bowling Green State University where he was a student of Distinguished Research/Artist Professor John Sampen, and a Masters degree in Saxophone Performance and Literature from the University of Illinois where he was the graduate saxophone teaching assistant for Professor Debra Richtmeyer. He has had additional studies with saxophonists Jean-Marie Londeix, Claude Delangle, Griffin Campbell, Daniel Kientzy, and Eugene Rousseau. Dr. Weiss-Holmes is a member of the North American Saxophone Alliance and has performed in many of the national and regional conferences, as-well-as at the World Saxophone Congress. Dr. Weiss-Holmes was the co-host of the 2014 North American Saxophone Alliance Biennial Conference which was be held at the University of Illinois. He was recently a featured artist in the “We Are Vandoren” international ad campaign, appeared on the cover of the Sept/Oct 2012 Saxophone Journal, and is a Selmer Artist/Clinician as well as Vandoren Performing Artist. Weiss-Holmes is married to Brad Weiss-Holmes and resides in Chicago, IL and San Francisco, CA. Dr. Weiss-Holmes is currently Interim Assistant Dean for Enrollment & Student Services, Artist-Teacher of Saxophone, and Head of Woodwinds at Roosevelt University Chicago College of Performing Arts. He was previously on faculty at the University of Illinois, the College of Wooster, and the University of Notre Dame.